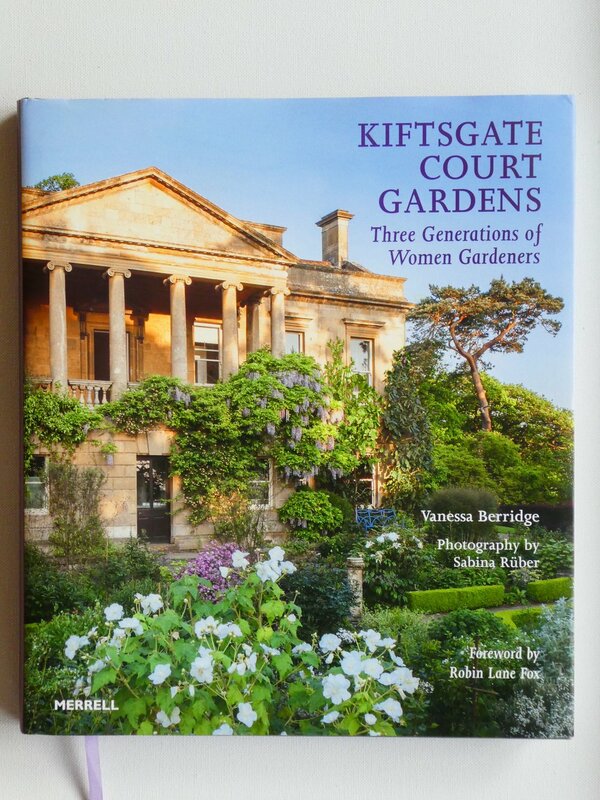 It has been an exciting start to the season with the publication of our book ( ‘Kiftsgate Court Gardens , Three Generations of Women Gardeners’ . ISBN 978-I-8589-4669-6 ) and a launch party at the Garden Museum in London. We had a wonderful evening with many friends and supporters. The museum is also hosting an exhibition on Kiftsgate until the beginning of June with beautiful photos and family letters and memorabilia from our archives. With Prue Leith at our launch. It is still really cold at night and even during the day, but the garden is on the move and the bluebells are surprisingly early and nearly full out. It will certainly be a ‘bluebell’ Easter this year as the daffodils are almost over. I also noticed the first abutilon flower this morning and lilies and peonies are bursting through the soil. We had a wonderful first visit to Morton Hall near Redditch, this week. 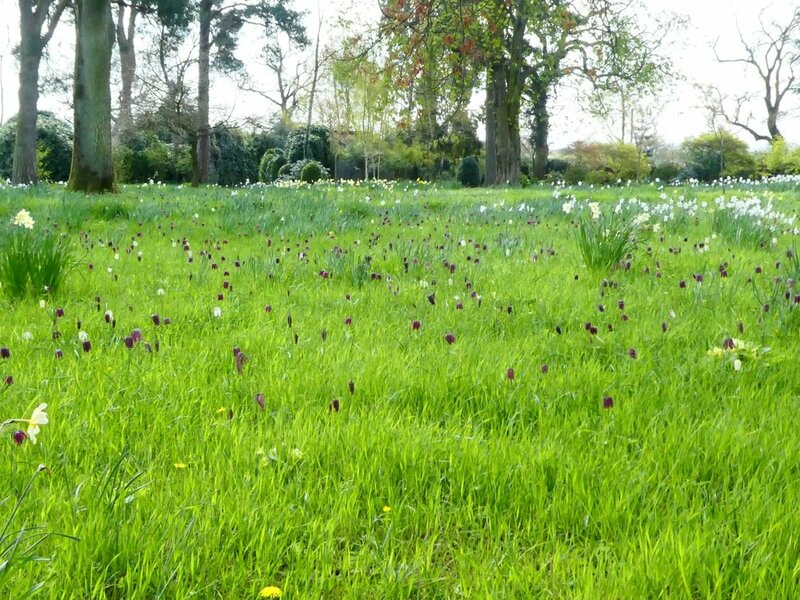 It is a stunning garden and at this time of year their meadows are full of beautiful fritillaries and narcissus, a sight to behold. Anna Olivieri is a passionate gardener and has a keen eye for detail and colour which really shows in her attention to detail. They are having a Tulip festival at the beginning of May which will be well worth seeing. Do have a look at their website for details. 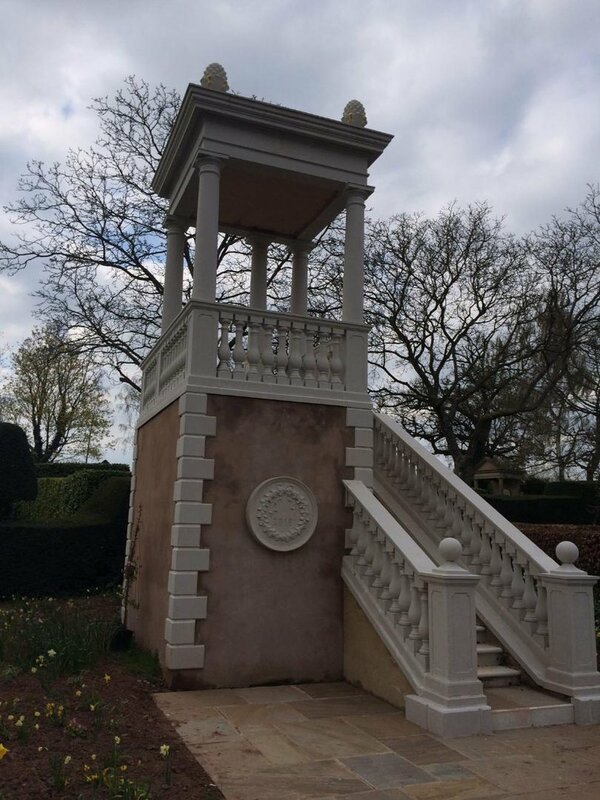 We also returned to the Laskett and lunch with Sir Roy Strong who showed us his garden and his latest creation, the Belvedere, built last year. 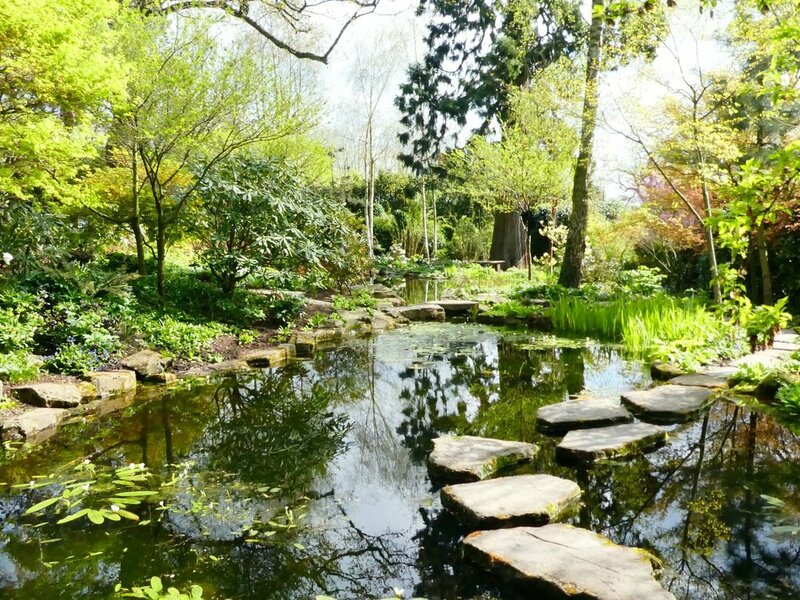 We have seen the garden evolve over the last twenty five years and it is extraordinary to see what he and his late wife, Julia Trevelyan Oman, created and developed. While the original framework has remained, so much has been added it is always a thrill to see a new vista, a new statue, a new border and, over recent years the addition of plants! The Belvedere gives another perspective to his garden and looking down on all his marvellous topiary and vistas is a joy. A dutch friend gives Roy six hundred tulips each year and this is the result. I am off to Houston Texas at the end of the month to see daughter Clare and family which will be a treat but then home in May when no doubt we will begin to get really busy again. March is always a busy month for us preparing for our opening on 1st April. After the balmy weather of February we now have gale force winds and rain and much lower temperatures. However the garden is still advanced and the magnolias have been stunning this year. We are also very pleased with a beautiful osmanthus yunnanensis which we bought several years ago at Pan Global, lovely glossy green foliage and a highly scented flower. The other plant that has flowered incredibly well is clematis armandi which now covers the whole of the railings round the little pond in the lower garden. Anything that flowers early is always a joy and stands out against the bare winter scene. We visited the Garden Museum in Lambeth for the opening of Emma Tennant’s flower painting exhibition which we much enjoyed. It is here that we too are having an exhibition to mark our centenary as a garden and also to coincide with the publication of our book ‘Kiftsgate Court Gardens, three generations of women gardeners’. The book has been written by Vanessa Berridge and the photographs were taken over two years by Sabina Ruber. The exhibition starts on April 10th and goes onto June 10th so lots of opportunity to go and visit. The exhibition includes many letters over the decades from notable gardeners, a portrait of my mother by Aubrey Waterfield as well as one of Aubrey’s painted panels from in the house, and to round it off, a film made last year of the garden with a running commentary by me! We have also been nominated for the newly reformed Historic Houses/Christies Garden of the Year Award for 2019. This year all members of the public are encouraged to vote online by going to their new web page at www.historichouses.org/goya2019.html so am hoping that lots of people having visited the garden will feel happy to vote for us. Warmth is returning to the earth, the days are noticeably longer and the birds are breaking into song again. The crocus are in full bloom in the sunshine and have really spread in the white sunk garden and by the entrance gate. Sadly Clare and David and Jack are now in Houston for a few years but seem to be settling in well and have found a house with a roof garden which I have been told I have to plant when I visit in April! However we had a wonderful week in Grenada with friends. Beautiful warm sea and very tropical vegetation. We visited several gardens including the Palm Tree Garden ( www.palmtreegardenslaura.com ) which was created by Lawrence Lambert around twenty years ago. He is a tremendous enthusiast and very green fingered and of course with their climate everything grows incredibly well and quickly. Only six weeks till we open again on April 1st and as always Tom and Philip flat out cleaning up the banks and lower garden. The swimming pool has been emptied and has got to be repainted this year but luckily with the warm mild conditions it should dry out fairly quickly. We noticed unusual damage to the base of the lead urns in the lower garden. Our only surmise is that the local squirrels are using them for their manicure! Can anyone else come up with a possible explanation. Somehow December’s diary never got written and here we are in 2019 so Happy New Year to everyone. We seem to have been very hectic with a wonderful Christmas in Scotland with my sister and then Johnny’s seventieth birthday celebrations in Vienna and London with the family. Vienna in the snow ! It is going to be another busy year with the publication of a book to mark the one hundred years since the family started to garden here. The Garden History Museum are kindly organizing a book launch in April with our publisher Hugh Merrill and then having a small exhibition in the Museum which will run until the end of May. Vanessa Berridge has researched and written the book and Sabrina Ruber has taken wonderful photographs over the past two years. Robin Lane Fox has written a preface and I have written a small piece for the end. All very exciting and can’t wait to see the finished article which is at the moment with the printers in China. We have also now appointed new caterers for the tearoom, Cotswold Catering, to take over when we open in April. They are a well established organization with years of experience so we are looking forward to working with them and expect to maintain the very high standard which Lutti Bates achieved when she was in charge. We are experiencing a very mild winter so far with the snowdrops already flowering, a contrast to last year, but the Beast from the East might be returning in February so winter is not over yet. The prunus incisa praecox is now in full flower, a beautiful tree covered in the palest pink/white flowers before the leaves appear. We have just returned from a weekend in Kircubrightshire and visited the walled garden nursery at Cally in Gatehouse of Fleet. This used to be run by Michael Wickenden who sadly died two years ago. It has recently been bought by Kevin Hughes who used to work at Spinners Nursery before owning his own nursery at Heale House. He is full of enthusiasm but has a lot of work to do restoring the garden which has been neglected for some years. A very exciting project and it will be fascinating to return and see how he is bringing it back to its former glory.